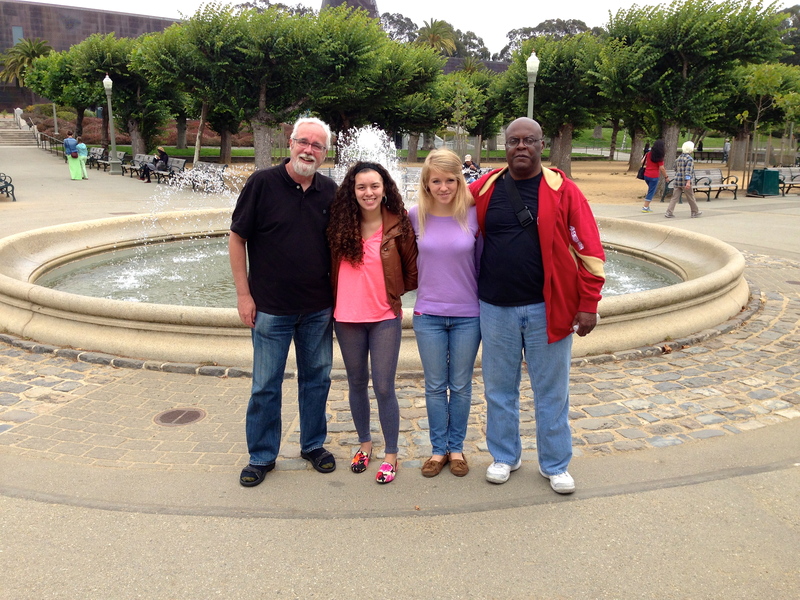 GLIDE Communications intern Char-Leen Craner accompanied fellow GLIDE Housing intern Audrey Phillips on a community field trip to the California Academy of Sciences with residents from GLIDE Economic Development Corporation’s 149 Mason Street Studios. This eight-story building featuring 56 furnished studio apartments provides a home filled with dignity and respect for those who were once chronically homeless. I remember my first visit – the day consisted of overcast skies, wicked cold and a slight breeze that chilled right through you. It rained throughout the city, strange for May but not completely unexpected – it was normal San Francisco weather. Yet, I felt excitement as I walked towards the building in a black leopard dress because that day was my birthday. Seven years old was a big step. 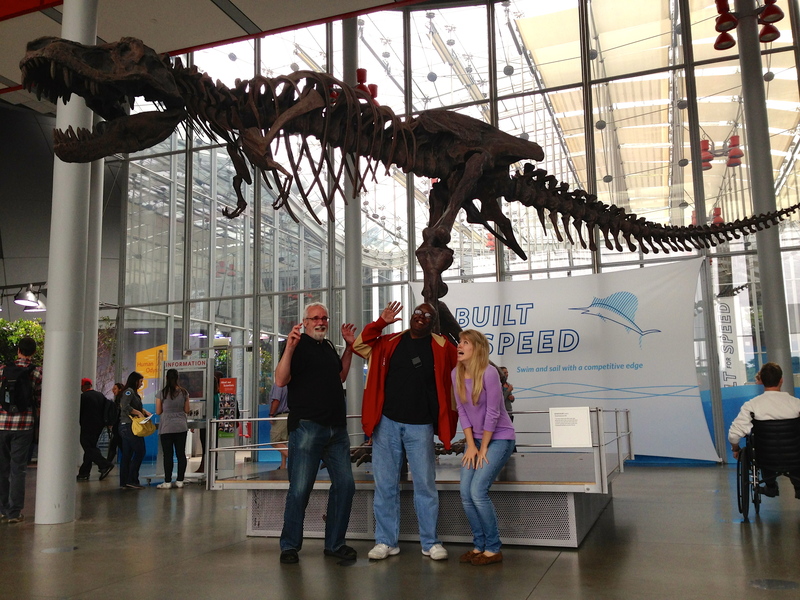 And, even more importantly, I was spending it at the California Academy of Sciences with my family. 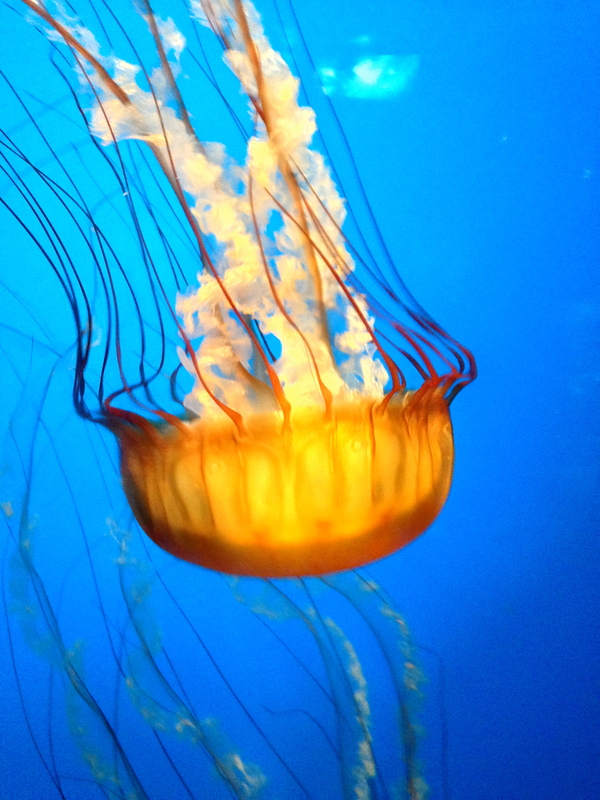 My most recent trip to the Academy of Sciences was not much different from my seventh birthday. While it was not raining, the mid-July weather remained cold and foggy. I was still as excited as I was when I was seven, but this time not because it was my birthday but to see the museum’s albino alligator (Claude). I was with a different group of people: smaller in numbers, older in age and also complete strangers. A total of five people spent their time with me that day, three of whom live in GLIDE Economic Development Corporation’s 149 Mason Street Studios: Allan, Thomas and Win. Unsure of how to interact with everyone, I started with the basics over lunch. Asking about interests and hobbies. I ended up spending the lunch hour discussing different forms of art and passions with Win (who had several ongoing painting projects) and Allan (who had a love for photography). We were ready to explore and quickly found ourselves dazzled by the coral reefs of the Philippines and the planetarium. As a group, we discovered the wonders of the universe, observed the ‘living roof’ and delved into unique southwestern pottery and jewelry of Native American tribes. Win was from the southwest, so he particularly liked the Native American exhibit and spent much of his time explaining to us different meanings and symbolisms. 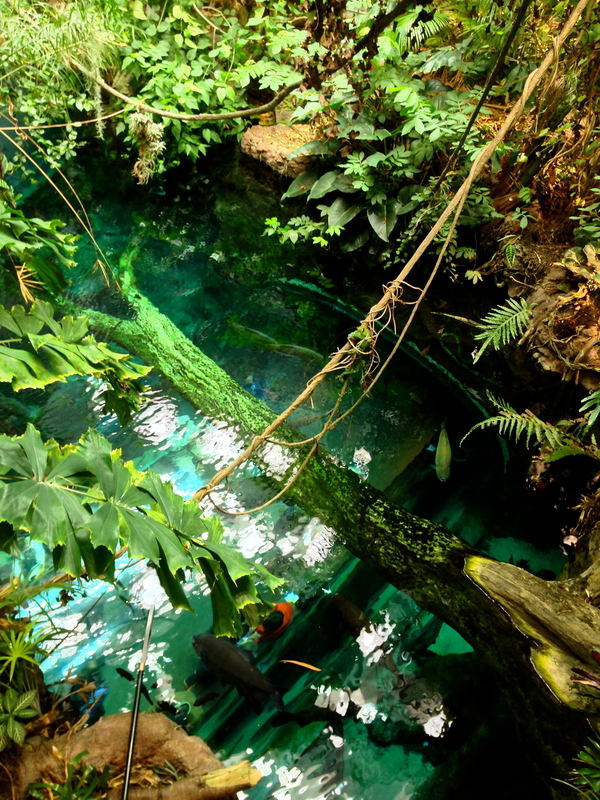 The rainforest dome was a tropical wonderland with its humid air and open jungle-like space. We spent close to an hour enjoying the exotic animals: parrots, frogs, fish, and even fist-sized spiders (not my most favorite part). We oohed and ahhed at the hundreds of butterflies that silently flew throughout the dome, sometimes landing directly on people’s faces. We truly saved the best for last, as the basement aquarium was our final trip of the day, and the most meaningful to me. While the groups of school children and families gushed at the wondrous underwater worlds, we discovered an inner peace. It was a sacred time for all us, being down there in the dark surrounded by literally a different world. We did not carry a conversation with one another, except to squeal excitedly about this fish or that or to bring to someone else’s attention a cool animal in the tank. 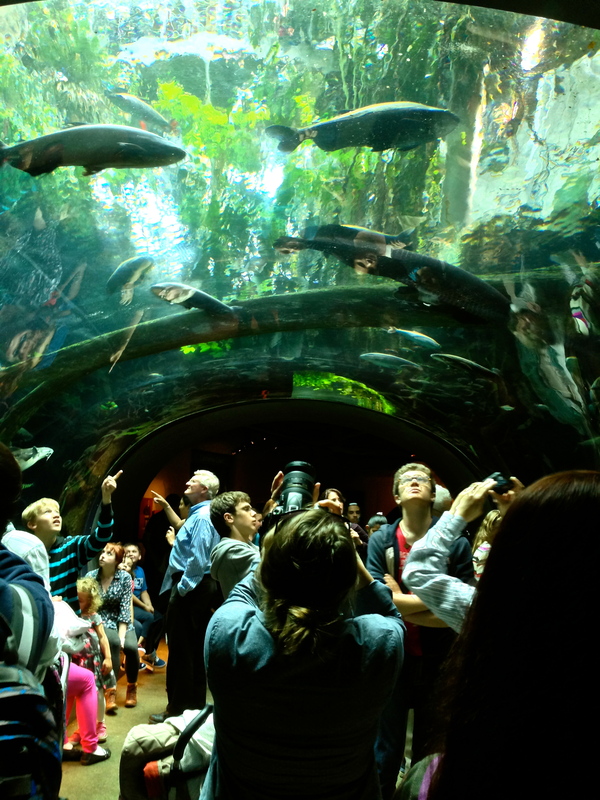 We enjoyed each other’s presence and marveled at the vibrantly colored fish and creatures around us. I found myself reflecting back to my time as a child visiting the Academy of Sciences with my family. I reminisced on my memories of being there with my parents, grandparents and siblings. It was bittersweet: I missed the feeling that can only be brought about by being with your own family. But, I then realized I was still in a family; it was just different from my own. I had no idea the pains and sorrows or the happiness of the lives of those I was with. I did not know their story; how they came to GLIDE or what their background was. And we did not share why we were there or what made us want to be a part of this community. I knew close to nothing about the people I was with, but I felt a bond grow between us as we spent the day together. And that felt right to me. GLIDE provided for all of us a day to get away; from the streets of San Francisco, the cars and bustle and drama. It gave us a day to just be. To see in my companion’s eyes and feel in my heart that we were present with each other and in those moments, content to just be alive and together, was very powerful. Not only does GLIDE provide housing for this group of people, but they also provide a chance to create a community among the residents at 149 Mason. Every month, the residents hold a birthday party for anyone who had a birthday pass. Community events – like the trip to CA Academy of Sciences – are held almost every week and help build bonds and ties among the tenants. GLIDE seems to have this remarkable way of creating a unique, accepting and loving community everywhere. GLIDE loves unconditionally. I felt the love that day, as I explored with my group. And I feel it every time I walk into the building or talk with clients and staff. I feel it when I see the volunteers in the lunch line or security at the front desk. I feel the love and the community no matter where I am at GLIDE, on a daily basis. And that’s the beauty of it all; the true radical inclusiveness that is GLIDE.